Standard Oil road map of Florida from 1954. The map shows the state of Florida, especially Central Florida and Orlando in 1954. Details of cities and towns, and major roads before Central Florida was bisected by interstate highways and the Florida Turnpike. Original color map, 1954: General Drafting Company, Inc.: Private Collection of Thomas Cook. Digital reproduction of original color map, 1954: General Drafting Company, Inc. Originally published by General Drafting Company, Inc. Copyright to this resource is held by General Drafting Company, Inc. and is provided here by RICHES of Central Florida for educational purposes only. Tarbell, Ida M., and David Mark Chalmers. The History of the Standard Oil Company. New York: Norton, 1969. 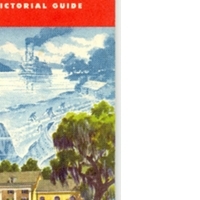 “Standard Oil Florida Road Map with Pictorial Guide.” RICHES of Central Florida accessed April 26, 2019, https://richesmi.cah.ucf.edu/omeka/items/show/1386.